This blackjack games glossary is divided into 3 parts at gamerisms. There is no doubt that this casino game should be categorized as one of several strategy games available to enthusiastic blackjack players online and off. Therefore, let's begin with the basics and strategy of the game. You can defeat blackjack house odds at casinos by counting cards but it becomes tricky when playing at online casinos. 21 wins: whoever comes closest to a total of 21 without going over wins. An ace is counted as a 1 or an 11. Face cards all count as 10. All other cards count as viewed. Hard Hand: a hand that does not include an ace. What you see on your two cards is your total count, example=9 + 8 = 17.
depending on whether you use the ace as a 1 or an 11. Therefore, a 5 and an ace could be 6 or 16. A 10 will turn a soft hand into a hard hand. Stiff Hand: a potential bust hand, such as a hard 15 or 16, which are the two worst hands you can get, unless the 16 is two 8s, then you can split them. Push: when you end up with the same count as the dealer. Same as a tie. No money is exchanged because you neither win nor lose. Burn Cards: The number of cards, the casino discards at the beginning of a new shuffle. Multiple Decks: 4 or more decks played in a game. They are always dealt face up. Single or Double Decks: Only one or two decks played in a game. The first two cards are dealt face down. The second statement, Dealer Must Hit Soft 17 is a Player Disadvantage. 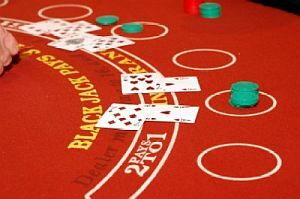 The best tables for blackjack players also use a single deck, have no restrictions on doubling down, allow resplitting, and have a surrender option available. All these conditions mentioned above are to the blackjack players' advantage for these strategy games. Below are 2 Blackjack Strategies: EZ Strategy by Henry Tamburin and Lucky 13 Strategy by Frank Scoblete. Both are recommended and can be printed for online games or land-based. Always stand when you have 17 or more. Always hit your 12 through 16 when the dealer has an upcard of 7 or more. Always hit your 12 against a dealer upcard of 2 or 3. Always stand on your 12 against a dealer’s 4 through 6. Always stand on your 13 through 16 against a dealer upcard of 2 through 6. Always hit hand totals of 11 or less, no matter how many cards compose them, against all dealer upcards. Always double on two-card totals of 11 when dealer has upcard of 10 or lower. Always double on two-card totals of 10 when dealer has upcard of 9 or lower. Always stand on your hands of A7, A8, A9 against all dealer upcards. Always hit on your hands of A2, A3, A4, A5, A6 against all dealer upcards. 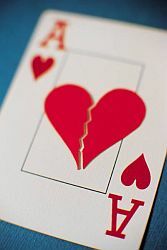 Even with these strategy tips, as players of the game, we know that blackjack can at times, break your heart! Blackjack games glossary is presented in 3 parts.